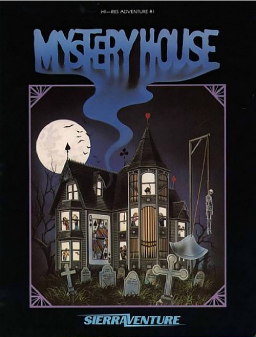 Mystery House was first released in 1980. It was the first game by On-Line Systems (later known as Sierra On-Line then later just Sierra), and was first sold with just a disk and a one-sided card-stock paper that served as a manual in a plastic zip-lock baggie out of Ken and Roberta Williams' home. The game was the first adventure game to have graphics, although they were just black and white line graphics. The story and graphics were made by Roberta Williams. The game was programmed and the graphics were scanned in line by line by her husband Ken Williams. It was released for the PC (via Apple ][ emulation) in the Roberta Williams Anthology pack in 1997. It was later re-released as part of Sierra's Hi-Res Adventures series as Hi-Res Adventure #1. It was released to the public domain in 1987. Because of it's public domain status, it received a port to the iPhone and iPod Touch by someone other than Sierra's intellectual property owners in 2009. The iPhone/iPod Touch version was created by Josef Wankerl. In 2010, this version was updated to include iPad support.